Kitesurf Langebaan Learning to kitesurf has been high on my priority list for years. This combination of wakeboarding, surfing and getting massive air looked very appealing. The kite pulls you along much as a speedboat does, you can ride waves and jump meters into the air. With most other activities strong wind is an enemy and I thought it would be great to do something where the wind makes me smile! We have so much of it around Cape Town in summer. Kitesurf Langebaan, there were many kitesurfers on the beach in the afternoon when the wind was blowing. A couple of years ago kitesurfing was a dangerous sport. Modern kites however completely changed the sport about ten years ago. The kites are easy to steer, to control the power and when the kiter’s hands leave the control bar the kite is stopped immediately. A car is also not to difficult to drive, but like a car a kite is powerful and potentially dangerous if ridden by an inexperienced operator. 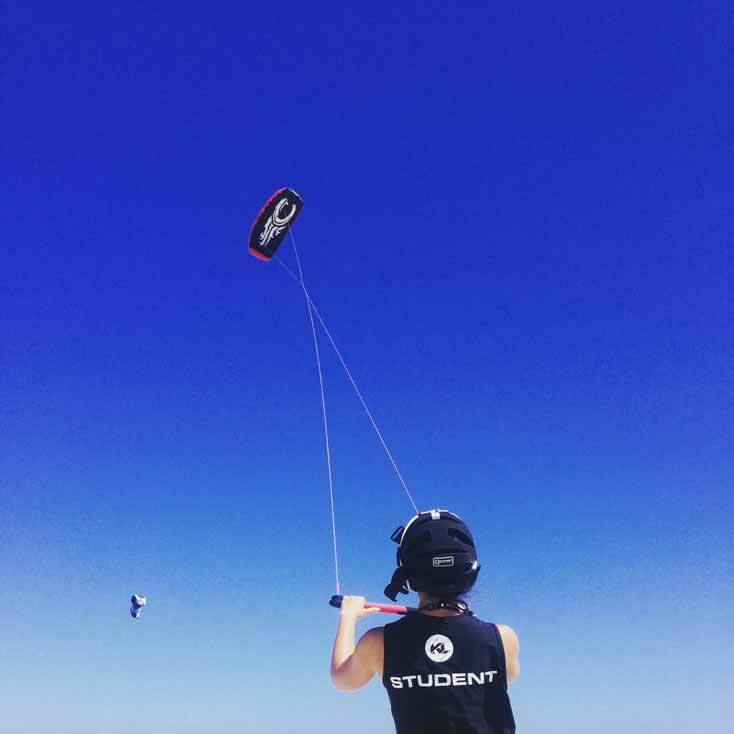 Most instructors and experienced kitesurfers told me it takes about 10 to 15 hours from starting with the kite to being able to ride the board. The learning curve is much less steep than for surfing. Still very few people can really kitesurf after two lessons. Even as a stingy nomad I will not recommend that you buy a kite and try to teach yourself. Good options would be learn from a friend with equipment, this is obviously cheaper, but you need a friend that can kitesurf well. He must also be willing to spend hours with you on the beach and in the water. The other option is a kitesurfing school. 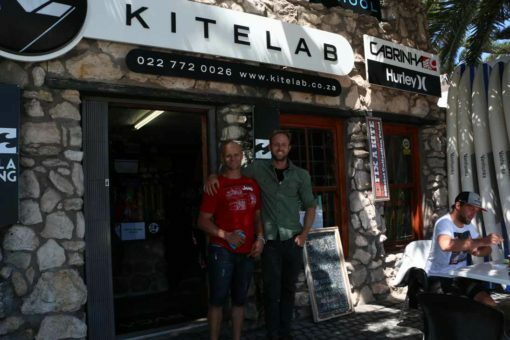 Our introductory course was with The Kitelab, an excellent IKO certied school in Langebaan, South Africa. A good way to learn is to do the The International Kiteboarding Organization (I.K.O.) courses. The IKO Kiteboarding programs are designed to help you learn in a safe way, taking you through all the Kiteboarder Skill Levels. The IKO Certification standards and training are recognized in over 40 countries worldwide. The Kitelab also offer private lessons, advanced lessons and gear rental. The Kitelab offers IKO levels 1 to 3. Kitesurfing is harder to learn than wakeboarding, waterskiing or snowboarding, but a lot easier than surfing. We shared an instructor and thus ended up having 4 hours of active lessons each over 2 days. At the end we understood how the kite works. We could fly it and generate some power. It will still take some time before we can fly it instinctively. We also mastered ‘body dragging’, being pulled around by the kite, lying in the water while steering. Our instructor, Jan, focused on safety and we had to master a skill before progressing to the next step. 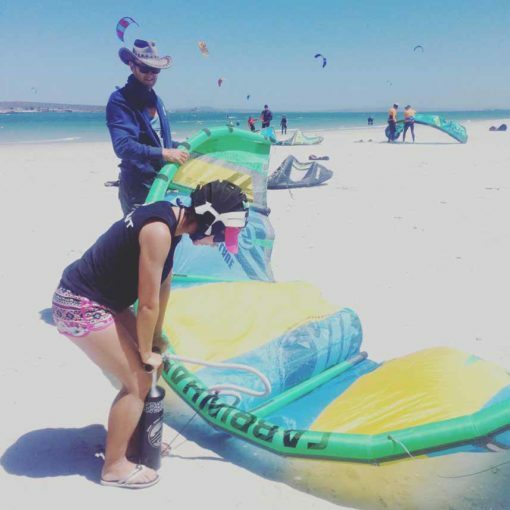 Alya pumping the kite, kitesurf Langebaan. We both got pulled on to the board more than once, but only moved a couple of meters before crashing spectacularly. I would like to have one more day of lessons, or go with an experienced buddy that is willing to dedicate a day. After that I think I will be confident enough to struggle on my own. Langebaan is a great kitesurfing spot. The Langebaan Lagoon, with a wide beach, flat water and little chop is perfect for beginners. It is also very popular for freestyle and freeride kitesurfing. 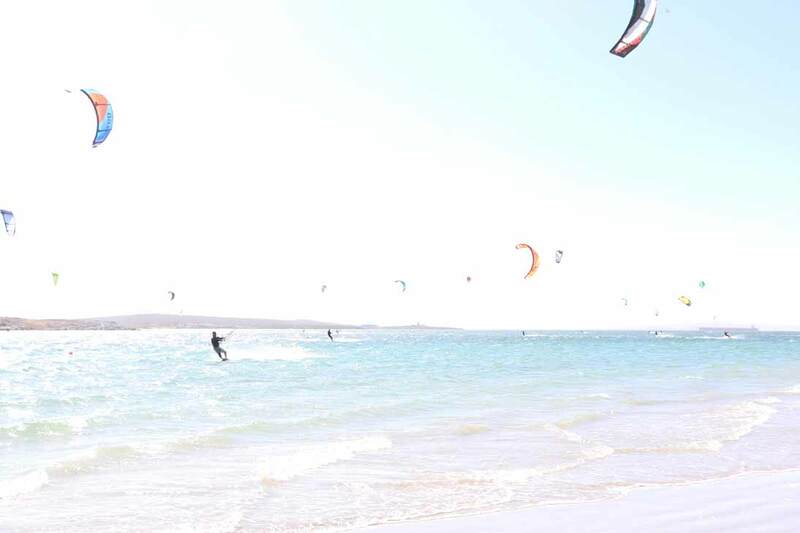 The two main kitesurfing spots are Langebaan Mainbeach and Sharks Bay. The best months are November to beginning of March, the main direction is SE to S. The wind here can get pretty strong, usually a little bit less here than in Cape Town. There is not really budget accommodation available in Langebaan ($10 or less per night). 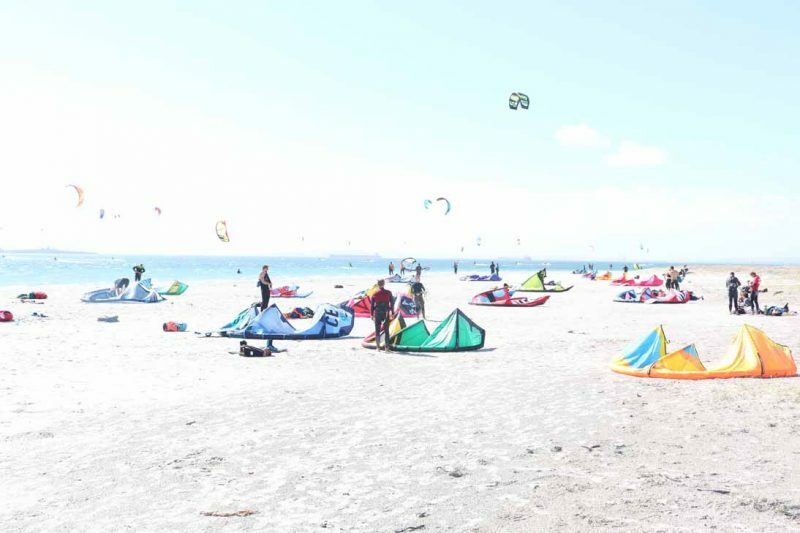 Windtown is very popular with kitesurfers. This small and very individual, privately owned, hotel is not really for budget travelers at R2760 ($207) per room for 2 nights (the minimum stay). The Pumpkin House is a nice place, run by the friendly owner. They describe this as ‘backpacker’s accommodation’, but at R800 per night for a room it is not cheap. AirBnB has some cheaper options, we stayed in a beautiful house for R500 a night for 2 people. Leentjiesklip caravan park is good option. You can camp next to the beach from R130 ($10) to R305 ($22) per campsite (1-4 people). Price depends on location and time of the year. Camping looks safe, facilities are good and the view is great. It is a short drive outside town. We had a good breakfast at Pearly’s Restaurant on the beach for R40 ($3). Die Strandloper sounds like an eating experience with a large seafood buffet for about R350. Langebaan has a good Spar supermarket for buying groceries if you stay in a self catering place. The West Coast is known for it’s rugged shorelines, unique coastal vegetation, heritage fishing villages and rough, unpretentious lifestyle. 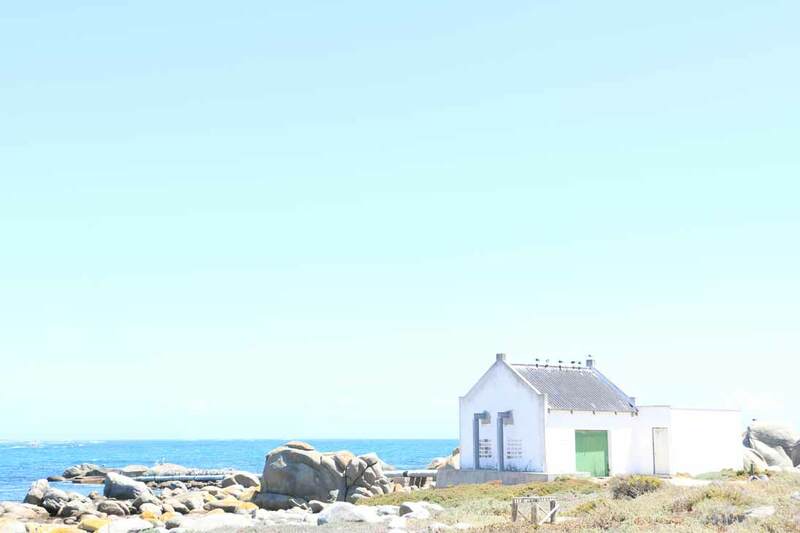 Take a day to explore the beautiful West Coast, visit Tietiesbaai, Paternoster, Jacobsbaai, Port Owen and St Helena. Check our West Coast travel itinerary HERE. The beautiful town of Jacobsbaai. Drive or cycle ride through the park, where you could see tortoises, zebra, gemsbok, wildebeest and ostrich among other wildlife. The park is an amazing place to experience the famous namakwaland flower season from August to October. When there is no wind there are other watersports to keep you busy with. Renting a stand up paddle board is popular. 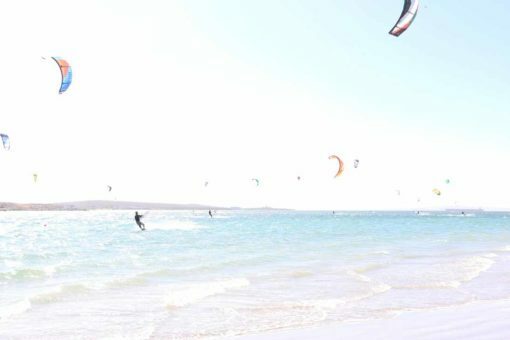 You can also do kayaking, canoeing , rowing, windsurfing, water skiing and jet skiing in Langebaan. Campbell with Alan, owner of The Kitelab and one of SA’s top kitesurfers.